Hate is a difficult word and it’s one that describes an emotion I try my best to avoid. There are very few people I struggle with in that respect but Noel Edmonds is definitely one of them. There, I’ve got it off my chest. I’m not sure what annoys me the most about him but his monumental arrogance, conceit and sense of self-worth will suffice for starters. I’m very surprised that his latest brainchild, Deal or No Deal on Channel Four has not been elevated to prime-time viewing as yet. Certainly it seems strange that one of the BBC’s favourite sons has not been brought ‘home’ to present this unfathomable game show from the Portland House institution, the way they have sought his services over the years. It was interesting to see how back in the 1980s’, the venerable old broadcasting company dealt with the fatality of a contestant on one of Edmonds’ show, The Late, Late Breakfast Show. The program was duly cancelled but the BBC appeared to usher him back into the Saturday night front line after an arguably decent spell away from our screens. Personally I felt it was a matter of stealth by the BBC bringing him back as soon as they dared to. 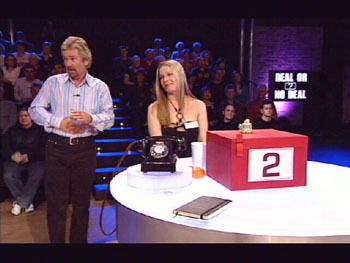 It’s perhaps just me, but I find his latest cash-cow, Deal or No Deal extremely irritating. Edmonds as usual acts his head off, hamming it up with his unfunny ‘accents’ but he is ably abetted by the contestants who are obviously chosen because they are ‘characters’. Most of them play up to their fifteen minutes of fame, showing off, stalking around the studio and imploring the other contestants to ‘give them a blue (or a red’). What the contestants don’t seem to recognise is that the game is a completely random one. There is absolutely no skill involved – they just simply choose and open boxes. ‘Give me a low one/open a high one’ (no I don’t understand the game even yet – this is through a total lack of effort to find out the rules however) but those people seem to believe that there is a SKILL element in the way they open those stupid boxes. In the meantime Edmonds suavely calls up the banker on the phone and has a puerile conversation with a person I’m far from convinced actually exists. Noel Tidybeard also offers a cringe factor when he patronises and smoozes around some of the young female guests in his paisley pattern shirts and highlighted hair. Uggh. Meanwhile the overly-greedy guests go on losing huge amounts of money through just pushing that little bit too far. Twenty thousand pounds disappearing down the drain as they pretend the price of a night out they’re now going home with doesn’t really matter and that they’ve ‘had a great time and met some fantastic people on the show’. The chap today claimed that he would definitely ‘keep his positivity up’ after stupidly losing around £18,000. Looks like the endless silly rituals and mascots didn’t work then. I went through a stage of reading biographies of people I detested. Invariably I came out detesting them even more. I agree his absence of humour is actually quite disconcerting – if not slightly chilling in its cynicism. I recall hearing an anecdote once about him flying someone to his estate via his helicopter. Maybe from the autobio? The story goes that there was an old fellow working in the gardens of his vast home who he duly proceeded to ‘buzz’ from a great height in the chopper, almost making the old chap jump out of his skin. ‘He’ll be alright’ quoth our hero. Him and Chris Tarrent!I didn’t realise Noel Edmunds was back on TV – and ignorance was bliss! Sorry to have reminded you, Shell! We’re getting into very dangerous territory here with talk of Chris Tarrant. I hope you didn’t see his appearance on that new Lenny Henry (oops there’s the ‘L’ word) program the other week. He came over as a rather rude and immature man for his age.